Yasiel Puig, pictured August 14, 2018, has been suspended and fined an undisclosed amount for "fighting and inciting a bench-clearing incident"
Los Angeles Dodgers outfielder Yasiel Puig has been suspended two games for his role in a bench-clearing fracas during the team's 2-1 loss to San Francisco on Tuesday. A statement from Major League Baseball's chief baseball officer Joe Torre said Puig was suspended, and fined an undisclosed amount "for fighting and inciting a bench-clearing incident". Giants catcher Nick Hundley was also fined an undisclosed amount for his part in the incident. Hundley appeared to take exception to an outburst from Puig at the plate. The two players confronted each other, Puig shoving Hundley twice to prompt players from both teams to pour onto the field. Before it was over Puig landed an open-handed smack against Hundley's catcher's mask and both players were ejected from the game. 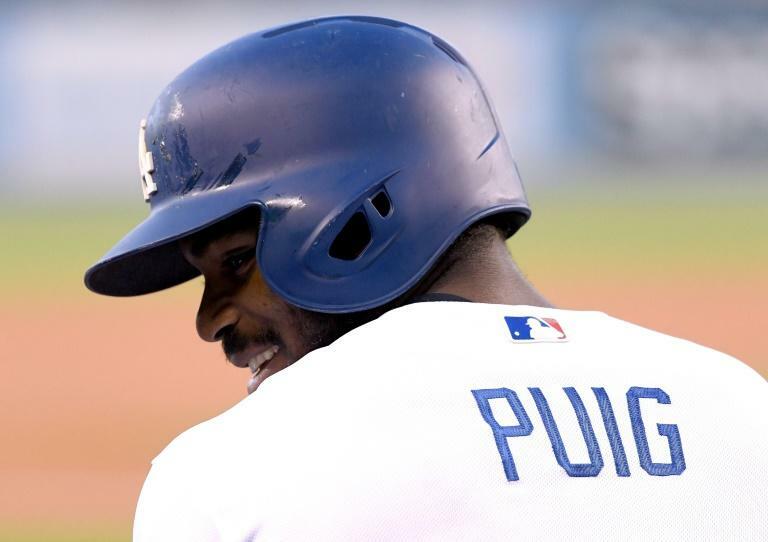 Unless he appeals, Puig will begin his suspension on Friday when the Dodgers play at the Seattle Mariners.